The erosion of the traditional voice service, together with the ever-increasing competition between companies, is pushing the telecommunications industry towards a major shift in its business models. Customers want more services in a more flexible way. Today, this shift can only be carried out by offering converged services built around the Internet Protocol (IP). Triple Play, a bundle of voice, video, and data services for residential customers, is the basis of this new strategy. Hens and Caballero explain how and why the telecommunications industry is facing this change, how to define, implement and offer these new services, and describes the technology behind the converged network. Triple Play analyses a number of business strategies to minimise costs, while migrating infrastructures and offering new services. Describes the elementary concepts of triple play service provision and gives detailed technical information to highlight key aspects. Discussed access networks, transport, signaling, service definition and business models. Covers the latest innovations in Triple Play services such as Ethernet in the First Mile (EFM), VDSL2 (Very High Speed DSL second generation), pseudowires andMultiprotocol Label Switching (MPLS). Explores video solutions (encoding, IPTV, VoD) alongside transmission and switching technologies (Ethernet, DSL, PON, NG-SDH). Includes a chapter on IP Multimedia Subsystem (IMS) and on fixed/mobile convergence. 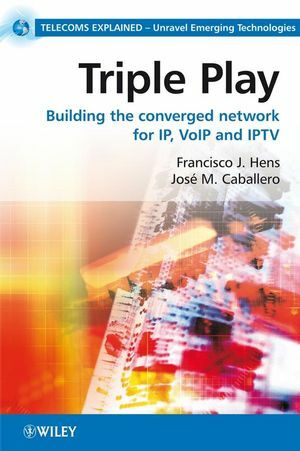 Triple Play: Building the Converged Network for IP, VoIP and IPTV provides decision makers, engineers, telecommunications operators, network equipment manufacturers, installers and IT managers with a thorough understanding of the changes of traditional voice service and its impact upon the telecommunications industry. Francisco J. Hens is a senior technology specialist at Trends Communications Ltd. He holds a B.Eng. and an M.A. in Telecommunications from the Universitat Politècnica de Catalunya. Francisco has a wide experience in local and extended networks, and many of his interests include most of the technologies deployed in the field of triple play, voice, video and data applications: TCP/IP architecture and routing, Ethernet and Gigabit Ethernet, SDH, ATM, and DSL. He has published books, articles and white papers on these subjects. José M. Caballero is the International Marketing manager for Trend Communications Ltd. He has an M.B.A., B.S. and an M.A. in computer communications. José has previously worked as a Communications Developer, Consultant at IBM, and is currently Director of Telecommunications in the UOC university. He is an acknowledged expert in next-generation networks and has published several articles, interviews and books on these subjects in the U.S., UK, Spain and Mexico. Over the last ten years José has given over 90 international lectures, seminars and conferences on Triple Play, NGN, SDH/SONET, 3G and Gigabit Ethernet. 1.3 Driving Factors of Triple Play. 2.1 Coding of Voice Signals. 3.2 Questioning the IPTV Business Models. 3.5 Television and Video Services and Applications. 3.7 How a Codec Works. 3.8 Windows Media and VC-1. 4.1 The Real-time Transport Protocol. 4.2 The Real-time Control Protocol. 4.3 The Session Initiation Protocol. 5.1 IP Multicast Groups and their Management. Chapter 6. QoS in Packet Networks. 6.6 Congestion Control and Recovery. 7.1 QoS in ATM Networks. 7.2 QoS in IP Networks. 8.1 Broadband Services Over Copper. 8.2 The Passive Optical Network. 9.3 The IP Multimedia Subsystem. 10.1 Ethernet as a MAN/WAN Service. 10.3 Limitations of Bridged Networks. 11.2 Legacy and Next-generation SDH. 11.7 Link Capacity Adjustment Scheme.